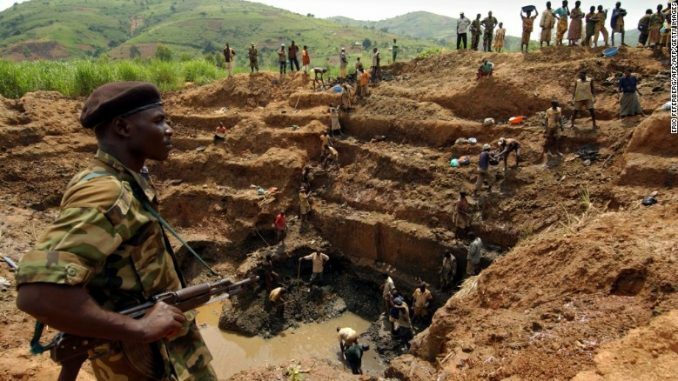 A gold mine in the Democratic Republic of Congo. 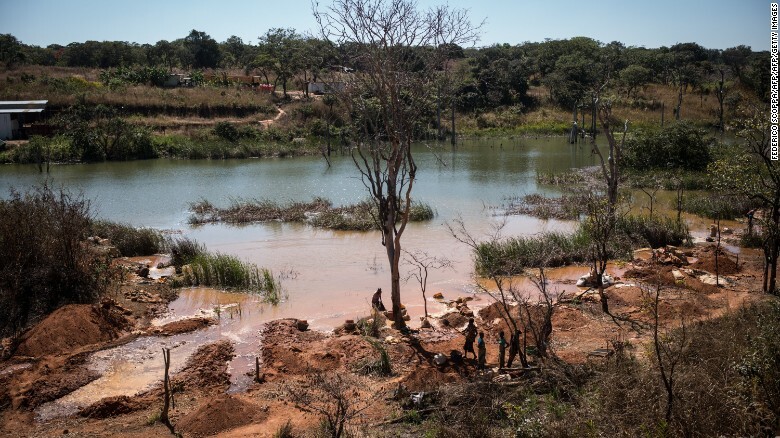 Katanga province in the Democratic Republic of Congo is blessed with enormous natural wealth, including vast deposits of precious minerals such as diamonds, gold, and tantalum. Katanga saw a spectacular mining boom around the turn of the century, when President Laurent-Desire Kabila and then his son Joseph licensed international mining companies to tap its treasures. This arrangement generated riches for the Congolese elite, and vastly more for the prospectors, but offered little to the poverty-ravaged population. From 1999 to 2002, the Kabila regime “transferred ownership of at least $5 billion of assets from the state-mining sector to private companies under its control… with no compensation or benefit for the State treasury,” a United Nations investigation found. The bonanza coincided with a ruthless crackdown on dissent. In 2004, a small, mostly civilian group took over a mine operated by the Australian firm Anvil Mining in Kilwa village, protesting that the company was making huge profits without rewarding the local workforce. According to a UN report, the Congolese army crushed the uprising and killed around 100 people, many by summary execution. Workers extracting cobalt from a lake in Katanga province, DR Congo. The combination of staggering wealth, rampant violence, and abject poverty in DR Congo is no coincidence, but part of a pattern causing devastation across Africa, according to Financial Times investigative journalist Tom Burgis. Burgis, a former correspondent in Lagos and Johannesburg, finds a wide variety of kleptocrats and rackets over his travels through dozens of resource-rich countries. But a common thread is that the wholesale expropriation of resources during colonial times has barely slowed through the post-independence era, albeit with new beneficiaries. Burgis cites another colonial hangover in the continued presence and power of oil and mining firms. 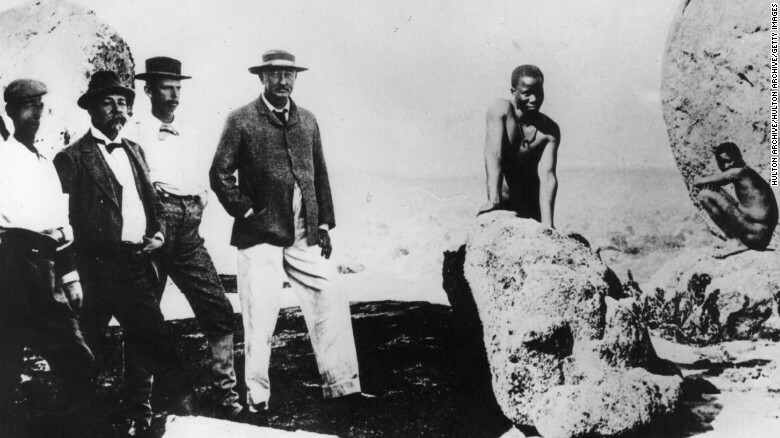 British businessman Cecil Rhodes (center) founded the De Beers diamond company in South Africa, implicated in colonial atrocities. The ability of governments to rely on resource revenue leads to corruption and oppression, Burgis argues, as they are not accountable to their people through a social contract based on taxation and representation. He cites Angola, which earns almost half of its GDP from oil, as an example of government as “a service for the elite.” A 2011 IMF audit revealed that $32 billion disappeared from official accounts between 2007 and 2010, a quarter of the state’s income. The Angolan elite rejects accountability and does not tolerate any challenge from the public, Burgis adds, recalling the recent case of activists being jailed for a public reading of a pro-democracy book. “Government can behave that way if it doesn’t need the consent of its people,” the author says. Angola has taken steps to address such criticism in recent years, with the 2012 election deemed “generally free and fair” by neutral observers. But human rights groups attest that oppression remains a fact of life. 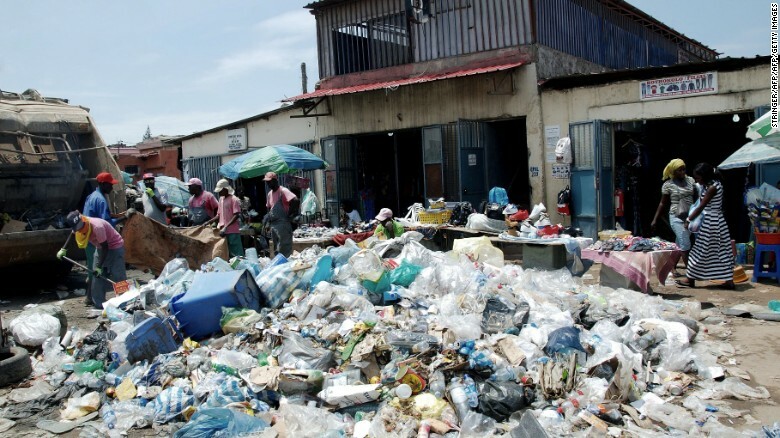 Garbage piles up as so little of Angola's wealth trickles down to the communities. The growth of offshore banking in the late 20th century created new opportunities for resource tycoons to cover their tracks, a practice laid bare in the Panama Papers. Israeli businessman Dan Gertler was an early pioneer. After forging a close friendship with DR Congo President Joseph Kabila, he was granted a near monopoly on exporting the nation’s diamonds, and quickly became a billionaire. Gertler routed the cash through an elaborate network of offshore accounts in tax havens, keeping the details of controversial deals secret. The era of global finance has opened African markets to a new generation of mysterious traders. 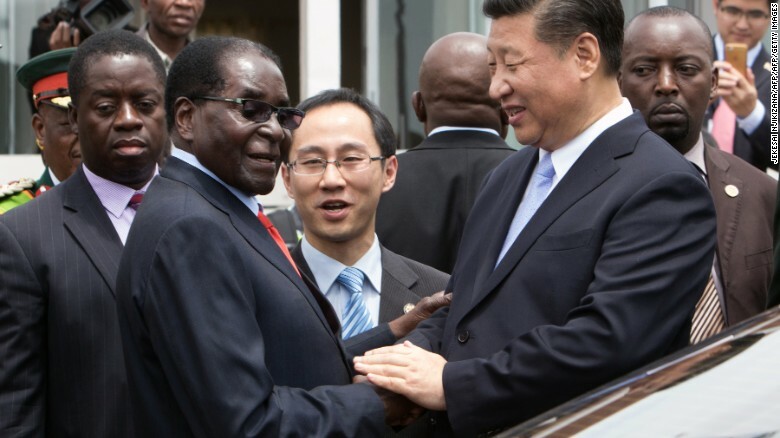 Burgis spent years on the trail of elusive Chinese businessman Sam Pa, who has cycled through multiple aliases while making deals across the continent from Angolan oil to Zimbabwean diamonds. Pa is believed to lead the secretive Queensway investor group, and Burgis claims he has represented the Chinese state, although the government denies this. Burgis is skeptical that resource industries can ever be reformed. 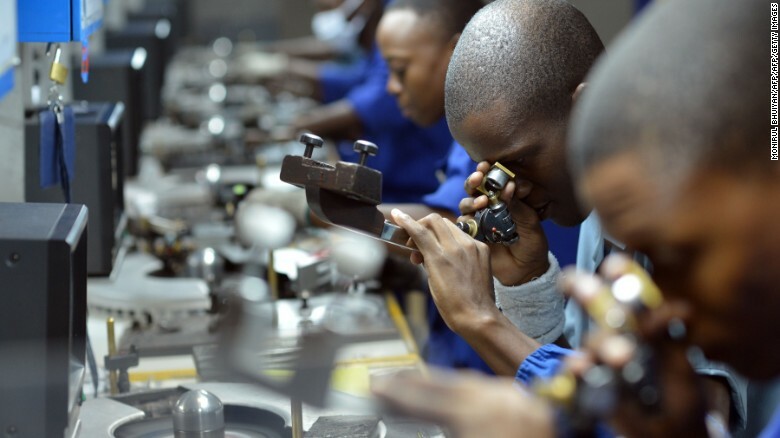 Botswana and South Africa have befitted from moving up the value chain — developing high-skilled industries from natural resources rather than just exporting raw materials, such as diamond polishing or manufacturing metallic goods. Burgis believes that diversifying economies away from a single resource — as President Buhari’s government in Nigeria is attempting to do — can mitigate the effects of dependency. He suggests another option is to keep resources in the country and implement high tariffs to protect domestic industries, but African leaders have been reluctant to adopt such measures. A diamond polishing factory in Botswana, part of a high-skill industry that has been developed from the nation's raw materials. Responsibility for the plight of resource-dependent nations goes beyond traders and dictators. The global economy still requires a huge supply of raw materials that originate in Africa, creating an imperative to maintain the existing, destructive model. Burgis applauds steps such as the Kimberley Process for preventing ‘blood diamond’ trade, but feels that developed nations could go much further. The author suggests a global public registry of companies and trusts to counter the use of shell companies in illicit deals. that complicity with the crimes around resource extraction extends from African dictators all the way to a European mobile phone buyer. At every level, delusion is a powerful barrier to change. Burgis recalls a meeting with a leading figure of Angola’s kleptocratic regime, who argued passionately that he was protecting his people from even worse abuses. With global democracy in retreat, what are the implications for Africa?